TechSmith is a recognized global leader when it comes to screen recording and screen capture. 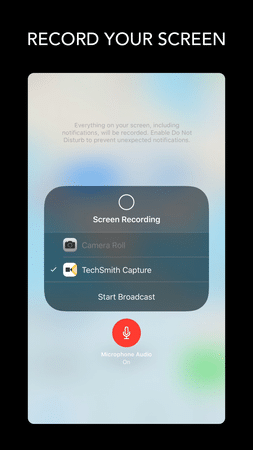 Just like they brought you the screen recorder software for the iMac, TechSmith has also made sure that the iPhone/iPad are not left behind when it comes to screen capture activities. When you need to record your iPhone/iPad screen, do not get through much hassle as this app is here to help you get the best out of your screencasts. These screencasts can be demos, walkthroughs, gameplay, an app review or any other kind of content on your device that you feel should be shared with others. 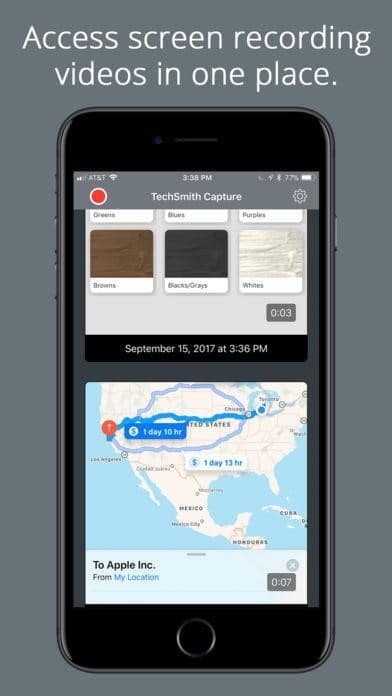 This TechSmith Capture review seeks to give you information on what to expect when you choose to use this app as your one-stop screen recording tool. 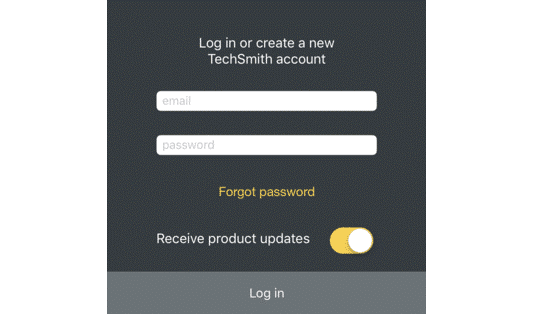 TechSmith Capture can be obtained from the App Store free of charge as of now. You must also be running at least iOS 11 to be able to experience all that comes with this app. Better yet, you are not in any way required to have your device jailbroken at all. Let us dive in and find out more on what TechSmith Capture has to offer. Does it really fit as a go-to screencasting tool for the iPhone/iPad? Read on to get an answer to this. We have all downloaded apps at some point that give us a headache on how to get started with them. This kind of headache is not present in TechSmith Capture as it gives a guide on how to go about your first screen record. From the moment you launch the app, you will have a step-by-step guide of how to set up the recording process, start recording and even how to stop the same when you are done with the recording. This means that even a first-time user will have this process like just a walk in the park. Another thing to note is that you need to have an account with TechSmith when getting started. You just need to sign in into your already pre-created account and you will be up and running. You don’t have an account? Don’t worry as TechSmith Capture gives you an option to create one and also a way to reset one that you have forgotten the password. Depending on the goal at hand you may need to record a video without audio or one that includes audio in it. Audio here is captured using the inbuilt microphone of your iPhone/iPad which can be activated or deactivated depending on your needs. TechSmith Capture lets you capture the screen in high-quality video combined with audio from the mic if need be. However, you have to choose whether to include audio before the broadcast process starts so don’t forget where appropriate. With the microphone, you will be able to add narrations, voiceovers, verbal reaction and any other kind of audio that you feel should form a part of the recorded video. You are also not limited when you need to capture footage from the camera. Just select the camera mode and you will be good to go. At times the screen recording process can catch you unawares and start without you noticing. This forces you to make compulsory edits afterward to remove unwanted parts or even making you redo the recording after doing away with the previous one. No need to worry when using TechSmith Capture as a countdown is provided to make sure you are conscious that the recording process begins in a few. Once the countdown runs out, be sure the actual broadcasting has started. Save the time of editing and re-recording with this handy feature. In the instance where you are making lots of screencasts, TechSmith Capture will list all of them in an easily accessible and organized library. The list is available for you the moment you open this tool as the first thing. From the list, you will be able to manage the recordings as you wish be it reviewing, instant sharing or even deleting the ones that you do not need. This is a handy feature when compared to other tools that require you to use the device gallery in order to manage recordings. 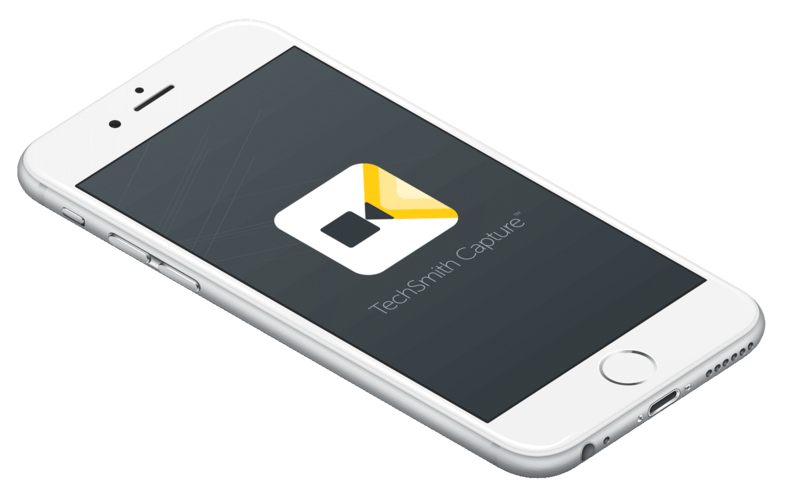 TechSmith Capture lets you share recorded videos directly to Camtasia or Snagit on your iOS device in very simple steps. You are just required to have sharing devices connected to the same network then initiate the sharing process from the iOS software. A QR code is generated for convenient sharing where you just need to scan it with the iPhone/iPad in order to authorize the connection. After that, the file will be sent directly without the need for cables. Even if the connection does not have Internet access, the files will still be transferred as this process does not require an internet connection. We have seen that TechSmith Capture provides a list where you can manage the screencasts. At the click of a button, you will be able to view or preview the files to check whether they meet your expectations. After the previewing, a share button is available for the instant sharing of the videos to any compatible destination of choice as provided on your iPhone/iPad. With this review, you can clearly see that TechSmith Capture is definitely a powerful screen recording app for the iPhone/iPad. You will not have regrets in case you decide to give it a try for you screen capture projects. 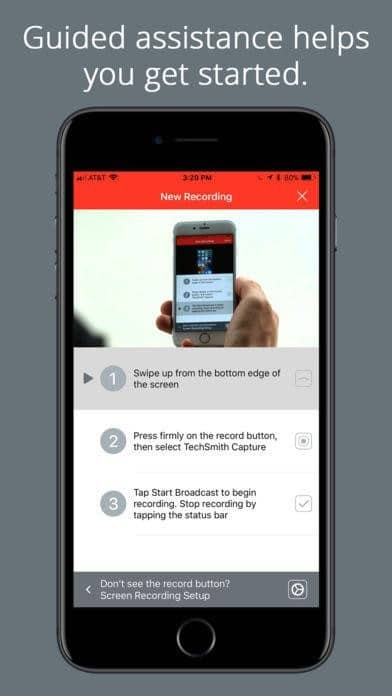 This app comes free and gives you the capability of recording the screen, capture footage from the built-in camera and on top of that include audio in your recording. How else can this get better? Even if it falls short of fully-fledged video editing tools, you will be able to capture videos that actually do not need recording if at all you take them in the best way possible. This app will not disappoint you.